A place for handmade journals, thoughts on journalling, occasional writing prompts and art journal prompts from classes I've taught. This 56 page step-by-step instruction tutorial, complete with photos and text demonstrates my original binding technique for a refillable journal with 4 folio sections which can hold over 100 pages. The unique binding makes changing, moving and adding pages effortless. This journal is made with 2 sturdy canvas panels as the covers. It has a flexible spine of handmade book cloth so it opens flat for ease of writing or sketching. The elastic which keeps it closed can also be used as a bookmark. These refillable journals make great art journals as you can easily remove your page to work on it with wet media, and then replace it once it dries. 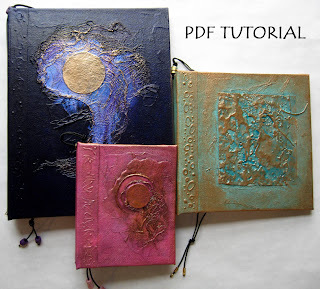 This tutorial is clearly laid out to be suitable for beginners as well as those with craft or book art experience. This tutorial was designed for those who wish to decorate and personalize their journal themselves, therefore this edition DOES NOT INCLUDE HOW TO DECORATE a journal.